On Sale Now! 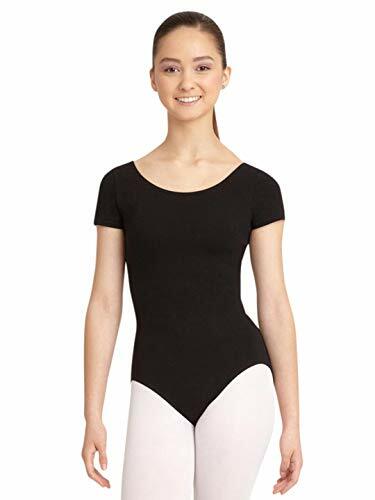 Save 5% on the Capezio Women's Classic Short Sleeve Leotard,Black,Medium by Capezio at Lamont Design. MPN: CC400-Black-Medium. Hurry! Limited time offer. Offer valid only while supplies last. Short Sleeve Cotton Leotard for Class or Rehearsal Soft and simple, this leotard is the perfect fit for long hours spent in classes or rehearsals. Short Sleeve Cotton Leotard for Class or Rehearsal Soft and simple, this leotard is the perfect fit for long hours spent in classes or rehearsals. The cotton material moves with the body, providing ultimate comfort through all of your leaps and turns. Simple and practical, the Short Sleeve Leotard is an essential for every dancerâ€s wardrobe. Product Features: Shelf bra for comfort and support Colors Light Blue, White and Pink have a full front lining Scoop front and back for a simple look Ballet/higher cut leg line, for the illusion of a longer line 90% Cotton for stretch and durability 10% Lycra Spandex Recommended care: machine wash cold, delicate cycle, hang dry -- Capezio Women's Short Sleeve Leotard | Adult Dance Wear.